New York Rangers President and General Manager Glen Sather announced today that the club has agreed to terms with forward Ruslan Fedotenko on a new contract. Fedotenko, 32, skated in 66 games with the Rangers last season, registering 10 goals and 15 assists for 25 points, along with 25 penalty minutes. He ranked fourth on the team with a plus-nine rating and fifth with 150 hits. Fedotenko made his Rangers debut in the season opener on October 9 at Buffalo after signing with the team as a free agent on October 4. 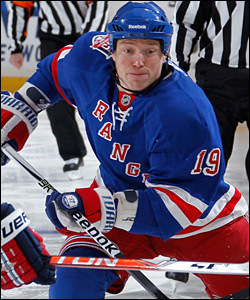 The Rangers posted a record of 9-0-1 when he tallied a goal, and were 17-2-3 when he registered at least one point. The 10-year NHL veteran skated in his 700th career NHL game on November 24 at Tampa Bay. In addition, Fedotenko tied for the team lead in assists (two), third in points (two) and ranked second in hits (23) while skating in five playoff contests. Ruslan Fedotenko, who made the Rangers' final cut after being invited to try out at training camp, had a remarkable first season in New York and was a big part of the team's "tough to play against" identity, which he will help carry forward into 2011-12. Fedotenko tallied both Lightning goals in the Cup-clinching 2-1 victory vs. Calgary in Game 7 of the Stanley Cup Final on June 7, 2004. During the 2009 Stanley Cup Playoffs, he established a career-high with seven playoff assists, and tied his career-high and ranked fourth on Pittsburgh with 14 points in 24 contests. The 6-1, 200-pounder has skated in 743 career games with the Rangers, Philadelphia Flyers, Tampa Bay Lightning, New York Islanders, and Pittsburgh Penguins, registering 160 goals and 173 assists for 333 points, along with 444 penalty minutes and a plus-24 rating. Fedotenko enjoyed his most productive season in 2005-06, establishing career-highs with 26 goals, 41 points and 164 shots in 80 games with Tampa Bay. He tallied a career-high, 23 assists and plus-18 rating in 65 games with Pittsburgh in 2008-09. In addition, Fedotenko has recorded 20 goals and 13 assists for 33 points, along with 58 penalty minutes in 88 career post-season contests with New York, Philadelphia, Tampa Bay and Pittsburgh.